The cover is the first thing that jumps out when looking at this Bible. It is beautiful. 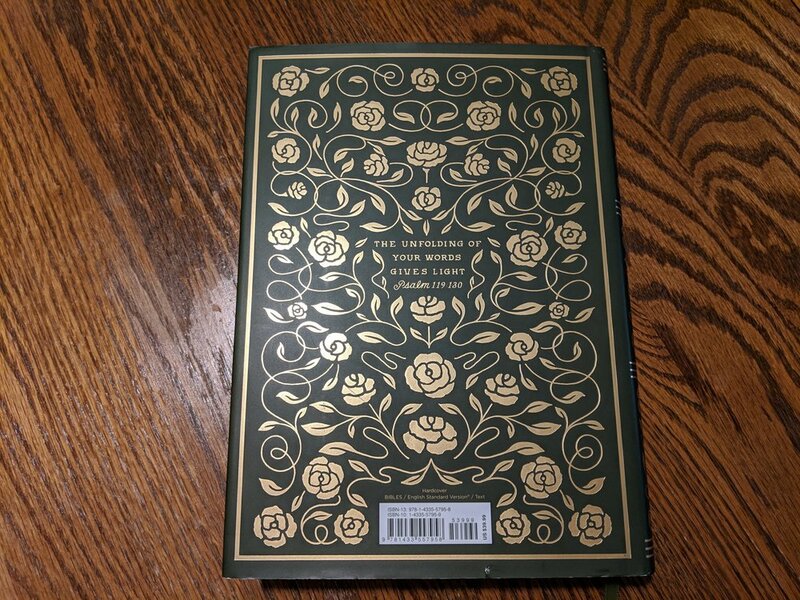 I received the green hardcover version with gold lettering, but it also comes in several other versions including a blue hardcover version and a burgundy TruTone version both with gold lettering. My version has a dust jacket, which can be removed to see identical art on the hardcover, which is how I would choose to use it. If you enjoy visuals, there are a lot of illustrations in this Bible. You will find them before every book, many full page illustrations, and they are scattered throughout in the margins where you journal. All illustrations were done by Dana Tanamachi whose work has been featured by Google, The Wall Street Journal, Random House, USPS, and Target. Tanamachi does beautiful work and you will truly appreciate how God has gifted her when you look through this Bible. Not being an artist myself, one thing I never would have considered is coloring the illustrations found within the Bible. I stumbled upon pictures on the internet where people have done just that. It’s a very cool way to make this Bible your own and meditate on God’s Word as you color and shade. I do love that this Bible is a journaling edition. This means there are generous margins on the edge of the page for you to write your own notes as you study Scripture. I use a journaling Bible as my everyday Bible so this is an important feature to me. The gorgeous illustrations paired with margins for journaling make this a feature rich Bible for creative types. I also think the font is a generous size for a Bible like this. 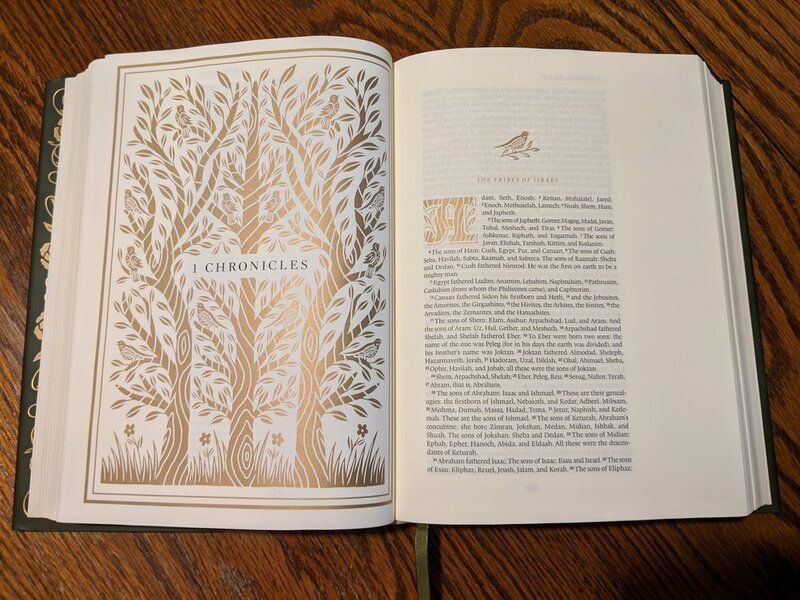 Crossway obviously wanted the illustrations to be the main feature of this Bible so they’ve packed them including over 100 full page illustrations. Extra pages make for a thicker Bible, but they still managed to put a 9 point font in this Bible. Many people will consider that small, but I find it to be a good balance. 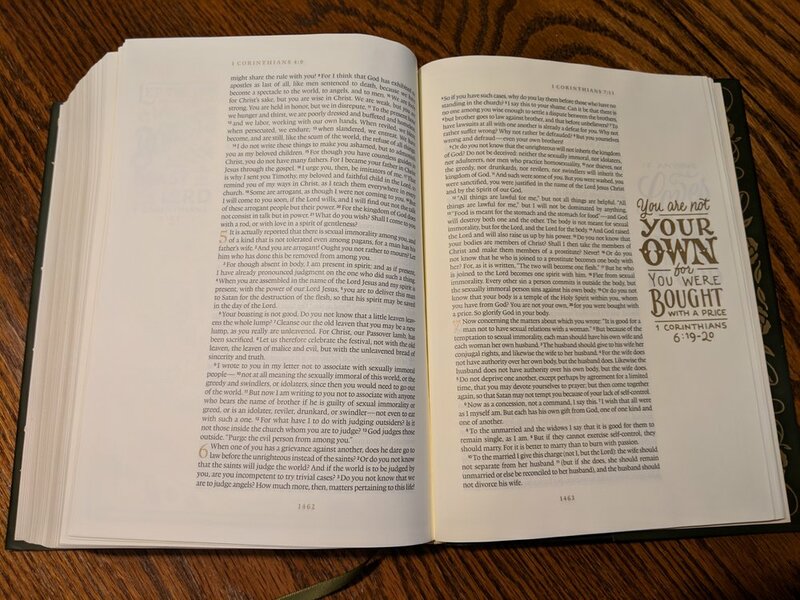 I have used Crossway’s ESV Large Print Journaling Bible, which has an 11 point font and is a big Bible. I’m currently using their regular ESV Journaling Bible and it has a 7.5 point font. Putting a 9 point font in this Bible is a happy medium, which I think will be satisfactory to most people. Now comes what might be my biggest complaint with this Bible. I understand this Bible is thick like a study Bible, but the pages are thin, which is odd since Crossway’s website claims this Bible has “thick, cream- colored paper.” They are a very nice, pleasing cream color, but you can easily see the illustrations from the opposite page on the page you’re viewing. This is distracting. 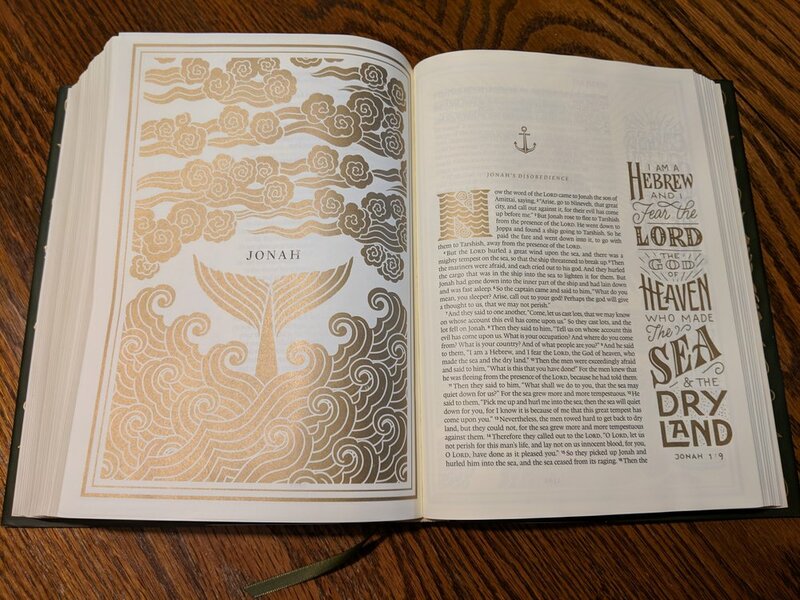 It would’ve been hard to have thicker pages and still keep the abundant amount of illustrations, but if words ghosting through the page bothers you then you may at least want to check this Bible out in person before you order it. One of my other favorite features of this Bible is that it’s single-column paragraph format. This is a must for me in journaling Bibles as I like to put my notes beside the section of text I’m taking notes about. This isn’t really possible with two columns so I do love that Crossway made the choice to make this Bible a single-column format. In conclusion, this is a really nice Bible. I’m grateful to have received it and been given the chance to review it. 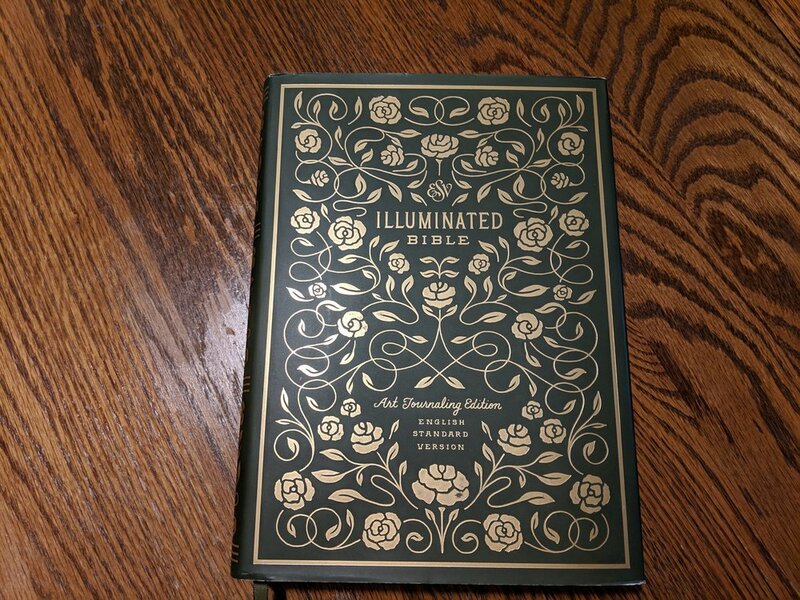 If you’re an artist or just a fan of beautiful illustrations, you will enjoy this Bible. It truly is a work of art that even someone like me can appreciate. You can pick one up for yourself straight from Crossway or from a retailer like Amazon or Christianbook.com. Disclaimer: I received a free copy of this Bible from Crossway in exchange for a fair and honest review.